The Lottery has been drawn for this week. uncannyness is the winner of the 160,200MP Jackpot with the winning numbers of 4, 6, 1, 2, 3 and 24! Congratulations! Last Week's Raffle has now ended. lionhart2024 is the winner of the Red DNA and 100,000MP prize with the winning raffle ticket number 11371! Congratulations! Make sure you buy your tickets for today's raffle - only 10MP per ticket! The Game of the Week has now changed to Muffin's Bricks. The Lottery has been drawn for this week. cookieies is the winner of the 159,400MP Jackpot with the winning numbers of 10, 2, 15, 8, 7 and 23! Congratulations! Last Week's Raffle has now ended. soetdegus is the winner of the Red DNA and 100,000MP prize with the winning raffle ticket number 13700! Congratulations! Make sure you buy your tickets for today's raffle - only 10MP per ticket! There are 3 new Funky pet colours and 3 new Fat pet colours! There are 3 new Lightning pet colours and 3 new Eleka pet colours! There are 3 new Balloon pet colours and 3 new Clown pet colours! Slater Park styles!!! There are 3 new Baby pet colours and 3 new Burnt pet colours! Super cute!! The Lottery has been drawn for this week. DojoGirl123 is the winner of the 204,700MP Jackpot with the winning numbers of 4, 6, 1, 9, 10 and 20! Congratulations! Last Week's Raffle has now ended. lilmonster66 is the winner of the Red DNA and 100,000MP prize with the winning raffle ticket number 13095! Congratulations! Make sure you buy your tickets for today's raffle - only 10MP per ticket! The Piracy Event has finally started! We are really sorry for the delay, but its going ahead as planned and will last for the next 6 weeks, ending in time for our Halloween Events! You can earn Dukka Points from restocking and battling only. There will be more ways to earn points later in the event!! You can spend your Dukka Points over the next few weeks at the Pirate Bay in Dukka Town. New and rare items will be on sale here and this will be the only place you can get them from! Once the event is over, they will all retire and these items are limited, so buy them as quick as you can! There will be new items added throughout the whole event - even a Limited Edition Pet you will only be able to get the potions for from this event!!! The Undying Festival has been cancelled this year but we will still be celebrating our 5th Birthday, which was last month, a little later than intended. The Lottery has been drawn for this week. philipsa is the winner of the 316,300MP Jackpot with the winning numbers of 4, 8, 16, 19, 22 and 24! Congratulations! Last Week's Raffle has now ended. xNekoMelx is the winner of the Red DNA and 100,000MP prize with the winning raffle ticket number 5294! Congratulations! Make sure you buy your tickets for today's raffle - only 10MP per ticket! The Game of the Week has now changed to Thunder Card. The Lottery has been drawn for this week. ntmyles is the winner of the 290,700MP Jackpot with the winning numbers of 1, 4, 9, 5, 7 and 2! Congratulations! Last Week's Raffle has now ended. MassPanic is the winner of the Red DNA and 100,000MP prize with the winning raffle ticket number 15848! Congratulations! Make sure you buy your tickets for today's raffle - only 10MP per ticket! The Game of the Week has now changed to Battle of Baspinar. The Lottery has been drawn for this week. sal2008 is the winner of the 282,500MP Jackpot with the winning numbers of 1, 4, 3, 2, 5 and 9! Congratulations! Last Week's Raffle has now ended. Benzo01 is the winner of the Red DNA and 100,000MP prize with the winning raffle ticket number 1327! Congratulations! Make sure you buy your tickets for today's raffle - only 10MP per ticket! The Game of the Week has now changed to Card Raider. The Lottery has been drawn for this week. akondj is the winner of the 290,100MP Jackpot with the winning numbers of 4, 6, 2, 9, 3 and 1! Congratulations! Last Week's Raffle has now ended. GracyPony is the winner of the Red DNA and 100,000MP prize with the winning raffle ticket number 2767! Congratulations! Make sure you buy your tickets for today's raffle - only 10MP per ticket! The Game of the Week has now changed to Sindi Slide. The Lottery has been drawn for this week. Hebicas is the winner of the 299,800MP Jackpot with the winning numbers of 3, 7, 12, 21, 8 and 19! Congratulations! Last Week's Raffle has now ended. jdasnj is the winner of the Red DNA and 100,000MP prize with the winning raffle ticket number 10582! Congratulations! Make sure you buy your tickets for today's raffle - only 10MP per ticket! I'm back!!! Sorry for the lack of news recently, but I've been busy dealing with private, personal health issues. News and updates will be coming out more regular now and thanks for your patience. Here are the missing mummy, prison, zombie and mutant pet colours for some of the most recent pets! The Lottery has been drawn for this week. elysse is the winner of the 294,900MP Jackpot with the winning numbers of 24, 7, 9, 22, 14 and 16! Congratulations! Last Week's Raffle has now ended. kittyangel21 is the winner of the Red DNA and 100,000MP prize with the winning raffle ticket number 3131! Congratulations! Make sure you buy your tickets for today's raffle - only 10MP per ticket! The Lottery has been drawn for this week. freakinpretty is the winner of the 352,200MP Jackpot with the winning numbers of 4, 7, 6, 9, 22 and 20! Congratulations! Last Week's Raffle has now ended. potchay is the winner of the Red DNA and 100,000MP prize with the winning raffle ticket number 19914! Congratulations! Make sure you buy your tickets for today's raffle - only 10MP per ticket! The Lottery has been drawn for this week. rianarooks is the winner of the 464,800MP Jackpot with the winning numbers of 14, 8, 3, 9, 5 and 16! Congratulations! Last Week's Raffle has now ended. kittens3 is the winner of the Red DNA and 100,000MP prize with the winning raffle ticket number 1826! Congratulations! Make sure you buy your tickets for today's raffle - only 10MP per ticket! The Game of the Week has now changed to For Sale. The Lottery has been drawn for this week. vincebaylon is the winner of the 434,800MP Jackpot with the winning numbers of 4, 8, 12, 16, 18 and 22! Congratulations! Last Week's Raffle has now ended. WMYoda is the winner of the Red DNA and 100,000MP prize with the winning raffle ticket number 5918! Congratulations! Make sure you buy your tickets for today's raffle - only 10MP per ticket! The Lottery has been drawn for this week. hopeb2 is the winner of the 526,800MP Jackpot with the winning numbers of 8, 9, 5, 6, 2 and 7! Congratulations! Last Week's Raffle has now ended. lilkiwigirl is the winner of the Red DNA and 100,000MP prize with the winning raffle ticket number 11920! Congratulations! Make sure you buy your tickets for today's raffle - only 10MP per ticket! The Game of the Week has now changed to Domino. The Lottery has been drawn for this week. Keylockin is the winner of the 560,400MP Jackpot with the winning numbers of 2, 5, 20, 3, 1 and 17! Congratulations! Last Week's Raffle has now ended. cellery187 is the winner of the Red DNA and 100,000MP prize with the winning raffle ticket number 4156! Congratulations! Make sure you buy your tickets for today's raffle - only 10MP per ticket! The Game of the Week has now changed to Newth Box. Piracy is becoming a serious problem in Marada. Trade between all of the Maradan worlds has been increasing and attacks on trade ships is becoming a daily occurance. Piracy has always been a threat to international trade in Marada, but with the recent developments in Dukka Town and Dukka Caves, the Dukka Pirates are making huge profits from reselling their stolen loot. A big event is about to start in Marada. The Dukka Pirates will have their stolen loot on sale for Dukka Points, a new currency that will be used throughout this event. You will earn points over the 5-6 weeks of this Summer Event from Games, Quests, Gym, Elite Gym, Restocking and Battling. All items on sale will only be avaliable from this event and will retire once its over, or randomly throughout the event. There will be lots of new items added, everytime the Pirates hijack another Maradan ship. There will be limited stock of these items too. More information will be avaliable soon, but stand by, the event will start tomorrow (Saturday). The Lottery has been drawn for this week. daybreaker20 is the winner of the 557,200MP Jackpot with the winning numbers of 4, 23, 5, 24, 6 and 25! Congratulations! Last Week's Raffle has now ended. therese82 is the winner of the Red DNA and 100,000MP prize with the winning raffle ticket number 19309! Congratulations! Make sure you buy your tickets for today's raffle - only 10MP per ticket! The Game of the Week has now changed to Hexxagon. This is the new Island Costume! 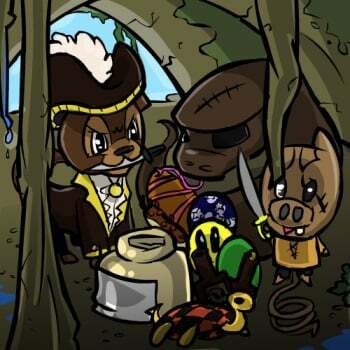 The Murfin, Crikey, Oglue, Pucu and Walee are the first pets avaliable in the costume - it'll be released really, really soon! The 57th species of Marapet has just been released!!! The Crikey is limited edition and will be avaliable really, really, really, really, REALLY soon!! We have just released the new Mission Game in the Dukka Caves. It will be added to the map soon, for now you can find it by clicking on this news post! The Pirate Mafia has control over all of the Pirates around Dukka Caves and Dukka Town. The Pirate Mafia receives free stolen loot and items from around Marada, in return for protection. The Pirate Mafia needs items that are only on sale for Dukka Coins. This Pirate Mafia needs your help. They want items on sale around Dukka Caves, Dukka Town and Marada for Dukka Coins. He has 30 different missions for you, each harder than the last. If you fail to bring any of the items, you will have to start again.